For some reason, WW1 has proved a popular topic with poets (established and new alike). If you have ever attended an open-mic night you are likely to have heard, at least, one. The majority of them seem to give the impression that the speaker (sometimes, ‘the shouter’) have actually taken part in the war, giving the impression that they are not really referring to the war, but their own little battles; the theme of WW1 exaggerating their petty downers (no-one feels more sorry for a poet than the poet him/herself). So I approached David Hynes’ collection with trepidation. 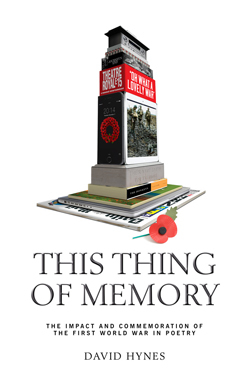 To give the volume a sense of occasion, GWL released it on Armistice Day - an interesting marketing ploy. But is it any good? Does it speak to us of why this unique conflict should mean anything to us? Does it throw new light on how we consider WW1? Well, not really. While we fight half-Christians, she’ll become the Hindia. Freezing in Ypres; storming for us throughout the Middle East. It feels like a one of those “Why we shouldn’t hate immigrants” lessons. However, one cannot escape the sheer cringe worthiness of it: ‘Pallied’, ‘Tallied’, ‘Pillion’; not only do the words grate, but they are totally inappropriate, in as much as they mean nothing. There are quite a few lines, throughout this collection, that made me wince. Today I’ve dug a ditch. Taken the day off work. And the worst thing to do would be to idly shout. But this is a million miles from the Great Man’s work. Betjeman may have used a similar structure for his form, but he sure as hell knew that much more was needed in order to create, even a half-decent poem. And this is the major drawback with Hynes’ work here: his inability to create a decent image. His attempt at creating similes and metaphors falls flat throughout and the reader is left to wonder quite what this is all about (Bubbling antebellum for/ England’s thank-you polites – The Lull). The reason for low-key German parties is that they bloody lost. Though I feel the Tommy would have given it a better rhythm. What in the world possessed GWL to publish this volume, is anyone’s guess. It is not as if they are a new company just starting out, they have been in business for over a decade. I can only think that they were on the look-out for something that would be relevant to this year’s centenary. But I have to wonder if they employ any proof readers, or has the expectation for quality disappeared entirely?